I have an old Peugeot single speed from the late 60's, it's so heavy I have to walk it up steep hills. (06-25-2017, 04:09 PM)Strigoi Wrote: I have an old Peugeot single speed from the late 60's, it's so heavy I have to walk it up steep hills. Yeah, I used to ride bike everywhere as a teenager in Toronto and I too had to walk it up steep hills and I was an athlete back then. And Rog', that Schwinn for 20 bucks was a killer deal! I'm lucky to still have my macadamias. That's a classic JR, I have only seen one bike with the gears on the frame. This Thread is telling . Ya know what ya find out by reading it ? Summer brings out the Kid in all of us . (06-25-2017, 04:36 PM)Ninelives Wrote: That's a classic JR, I have only seen one bike with the gears on the frame. Yeah rare as Sunday mail. Loved that banana seat with the shocks. (06-25-2017, 05:05 PM)Cynicalabsurdance Wrote: This Thread is telling . yup, I think there's still a bit of that in all of us 'round here - and that's a good thing! I miss having a bike, I think I might have to go get one tomorrow. 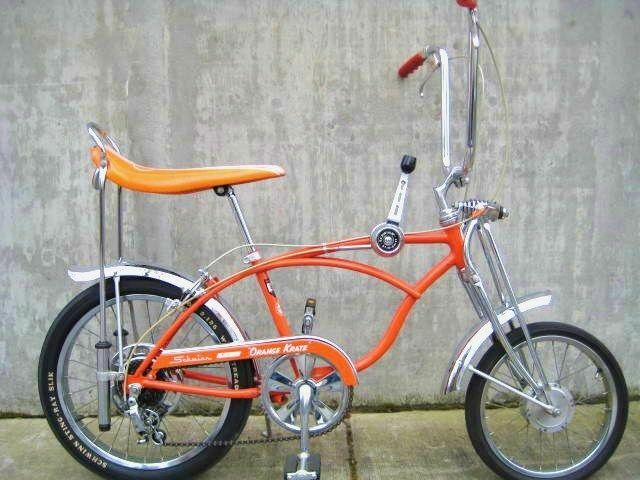 You had a Schwinn Krate ,, and you claim you weren't a Spoiled Child ? Those things are now worth more than the Truck I drive . There's a Whole Community of Collectors for those old Krate Bikes . (06-26-2017, 12:26 AM)Adde Wrote: I miss having a bike, I think I might have to go get one tomorrow. Don't you dare buy a Bike without consulting me , I'm the Bike Wazoo . DO NOT BUY DEPARTMENT STORE BIKES , THOSE CHEAP BOOGERS WILL KILL YA ! the Brakes fail on them . Craigslist garage sale adds . newspaper garage sale adds . any Bikes that people left behind at the Bus stops or front of Buses ,,, cause a lot of people do . in Oregon , Policy is , if you have very little Money , they'll give you a Bike . Those came from the factory like that? Funny , where's the Dancing Banana ? Weather Gawds are DRUNK !